In Ranching, Mining, and the Human Impact of Natural Resource Development, Raymond L. Gold observes and reports on people whose lives have been significantly affected by the industrialization of rural communities in the American West. Such community change research is rarely done, so this classic study is invaluable for its real world groundings applicable to a variety of social science theories. The study evolved out of ethnographic research on Western communities done over a full decade.This was the first work of its kind to examine and account for the rise of local citizens' groups on the sense of being a community. Its account of this process covers both ordinarily slow and extraordinarily rapid areas of change in the American West. In this regard it is a contribution to basic social theory, showing clearly the interrelation between small-community and large-society elements of the structure and functioning of community life. 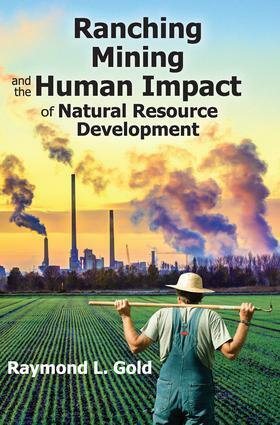 No other book brings together the story of social effects of natural resource development projects in the American West.This book shows how to implement a social policy concerning resource development and public agencies. It is intended for people interested in the environment, American society, rural and urban affairs, social impact assessment, and urban structures generally. It is also aimed at industrial and community planners and natural resource development firms.